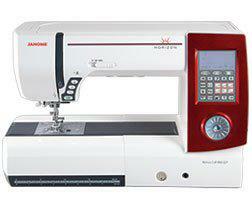 This Special Edition of the Horizon Memory Craft 8900 QCP features a unique Janome red face plate. Hurry! There's a very limited supply of this special model! Creativity is about unlocking possibility, giving you features to expand your otpions, and making those features easy-to-use right out of the box. The Horizon Memory Craft 8900 QCP does this. Come away with this machine and your creativity to explore an entire world of quilting and sewing.